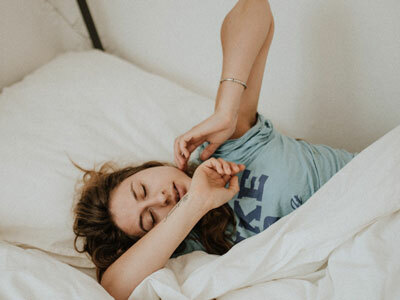 Getting a good night’s rest and also being able to wake up with a burst of energy every day can be tough. 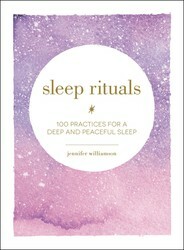 Jennifer Williamson, author of the books SLEEP RITUALS and MORNING AFFIRMATIONS, has created an evening and morning ritual to add to your daily routine so that you can sleep well and then wake up refreshed and ready to conquer your day. Rituals are personal practices you treat with intention. The fact that they don’t require a lot of time (just your full attention and care) makes them a perfect beginning and ending to your day. Try these simple ritual sequences — one for tonight and one for the morning — to help you rise each day with hope, purpose, and joy in your heart. For each ritual, create an environment that you feel good being in. Use dim lighting and soft music at night, uplifting music in the morning, candles anytime, and leave your devices behind. #1. Have a tea ceremony: This can be a highly spiritual experience or simply a relaxing one. Enjoy a decaf herbal blend 1-2 hours before bedtime: chamomile flowers, lavender flowers, lemon balm, peppermint leaf, rose petals, etc. Add a touch of honey, milk, or coconut oil for a sweeter treat. Slow down and savor the sensations: the whistling kettle, the warmth of the mug in your hands, the steam rising to meet you, this time for yourself. For more whimsy, sip your tea while you color your way to restful thoughts and images. Choose calming templates (mandalas, starry skies, cozy things) and connect to the physical experience of creating something beautiful. #2. Practice calm on the yoga mat: Embrace comfort and simplicity with slow, passive postures. Bring in blankets, pillows, and crystals. Child’s Pose offers a sense of safety and peace. Legs Up the Wall (or over the couch) shifts your perspective. Savasana is the ultimate pose of rest. End with several deep belly breaths: hands on your abdomen, inhale through the nose for 3–5 seconds. Feel your rib cage expanding in all directions. Exhale for a longer or double count. #3. Soothe your nervous system with a magnesium oil foot massage: Massage the entire foot with gentle strokes, kneading, or firm pressure on the pad of your big toe and along the ball of the foot for targeted relief. Magnesium oil helps reduce pain, inflammation, and overwhelm, calming the mind, body, and emotions. Hand on heart, imagine inhaling the unconditional lovingkindness (metta) of the universe. Each exhale dissolves worry and grievances. Inhale love. Exhale metta to your loved ones. Inhale forgiveness. Exhale metta to anyone you have a grievance with. Let the imagery replace your thoughts about them. Continue, sending metta to all sentient beings on the planet, including yourself. #1. Start your day with a positive affirmation: Helpful self-talk encourages you to seize the day before anyone or anything else can. Read your affirmation slowly (get the book with 200 of them here). Savor the moment and how the words feel. Meditate, even for a few deep breaths, on how you can embody the affirmation today. Stretch your body. Embrace this chance to live with intention and purpose. #2. Take a mindfulness walk: A 5-minute walk in nature can prevent stress, lift your spirits, and remind you that beauty is everywhere. If you can’t get outside today, you can still bring ritual alive through whatever you’re doing. Move slowly, tuning into your body and surroundings. See the big and little details. Treat every sound and sensation with curiosity rather than judgment. Silently thank the earth, air, and sun for the energy you need to live, breathe, and dream. If your mind wanders, just return to an easy, open awareness of the present moment. Let this be your whole world. Try equal breathing at the same time, inhaling and exhaling for equal counts through the nose. #3. Talk about what you love: Share ideas and gratitude, words of affirmation, and what you’re excited about today. Put your phones down and be there with each other. You can even share your thoughts and feelings with your pets and plants (they’re great listeners). To support you through every phase and season of life, gift yourself a copy of Sleep Rituals and Morning Affirmations. Because when you feel better, life is better. 200 energizing affirmations to help you get up on the right side of the bed every morning, and start your day with a boost of enthusiasm and positivity! Start your morning with motivation with these positive affirmations to help you hit the ground running! With 200 short, simple, and easy to remember phrases, you can choose the message that’s perfect for you and your day! 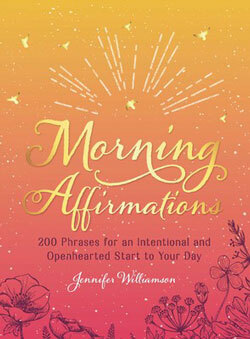 From waking up filled with optimism and confidence to inspiring you to keep your positive outlook and purposeful momentum going all day long, these quick affirmations will empower and encourage you to be your best!